One of the things I absolutely love about my Cricut Maker is that one minute I can be cutting delicate tissue paper and then next switch to balsa wood. It really allows you to do so many different and new things all with one machine! I love the versatility and I wanted to put that to the test with this project. For this garland, I used three different blades and materials and the Maker cut them all like a dream. 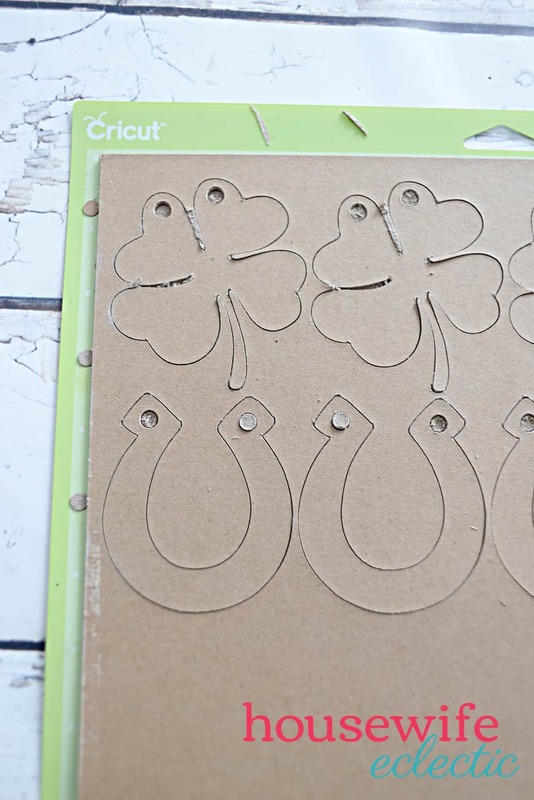 I used the knife blade to cut 2mm chipboard in the shape of shamrocks and horseshoes. I used rotary blade to cut felt letters. This is my favorite tool! I get so giddy about how well the maker cuts felt and I used a fine point blade to cut glitter iron on. Each item cut perfectly with no issues. Follow the instructions below. One of the things I was most excited to experiment with when the Cricut Knife Blade came out was chipboard. It is more heavy duty than a lot of other cutting materials, allowing you to make things that are stronger than out of a thinner material. I have cut chipboard quite a few times over the last couple months and they have all been a fantastic success. 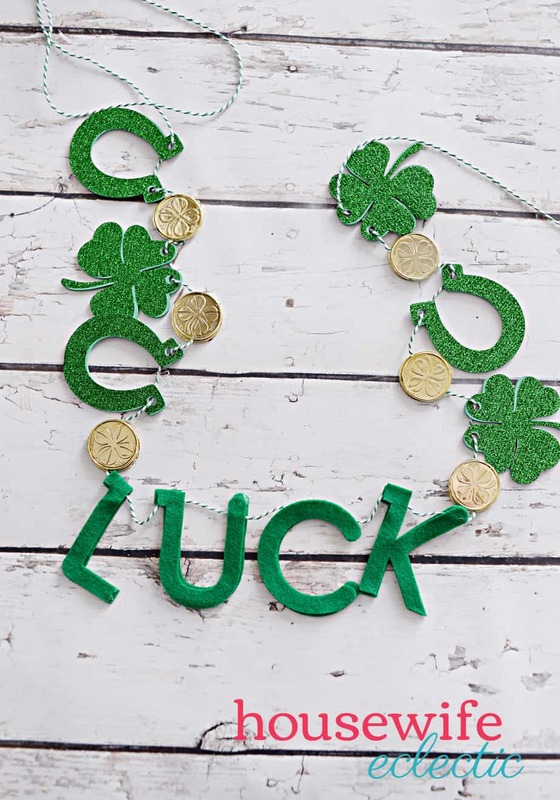 The Maker even cuts the tiny little hanging holes in the shamrocks perfectly. 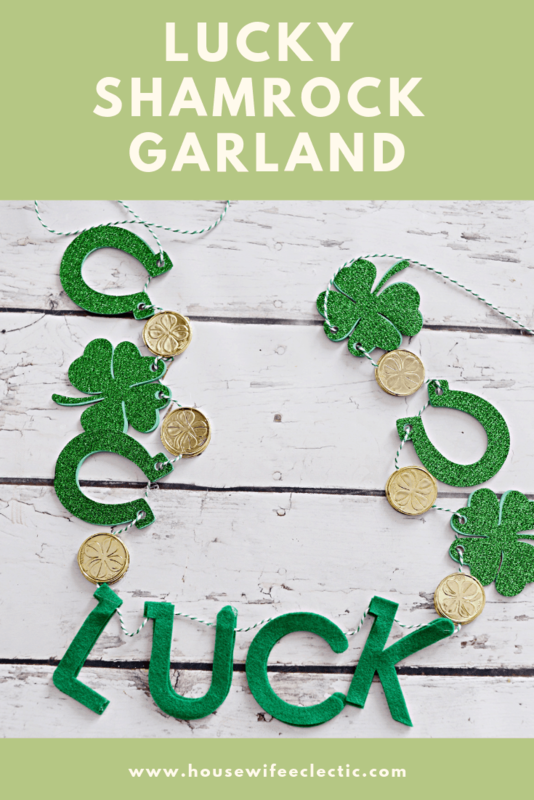 I used: Horseshoe (#M6DCE882) , Clover (#M849839B) and Anywhere Font from the Cricut Library. To make things really easy, you can find my cut files here. 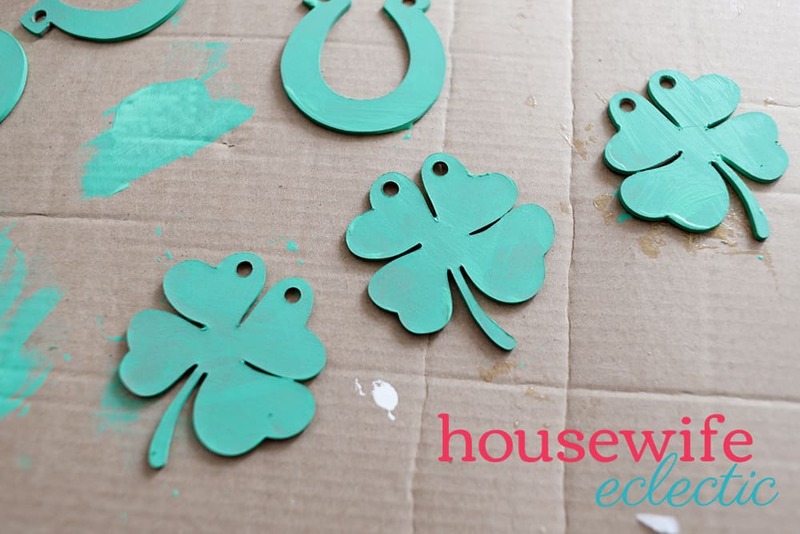 Simply add the Shamrocks and Horseshoes to your mat and resize them to 3 inches tall. Add a small circle to your artboard and resize it .25 inches. Lay the small dot over the top of your design, where you want the hanging hook to be. Select your shape and the dot and then hit slice in the lower right-hand corner. Pull the dot off of your shape and then pull a second dot off as well. Now your Cricut will cut the hole you need to hang the designs. Repeart with the other. After you have cut out the small hanging holes. Copy and paste the design two more times so you have three of each designs. Set your material to heavy chipboard and let it go. The machine will take about an hour to cut. Don’t get discouraged, it will be fantastic. Once the machine is download, unload the mat and peel off your cutouts and then paint them with a light green color. Iron-on is hands down the thing I cut the most with the Cricut Maker but did you know that you can use iron-on on things other than cloth? It is seriously the easiest material to work with, so I ALWAYS pick iron on when I can. 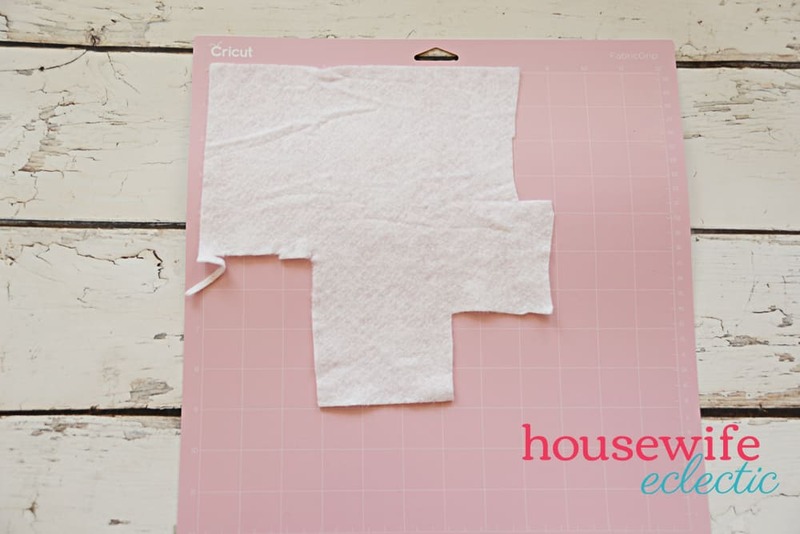 For this project, we ironed iron on right onto chipboard and it worked fantastically! Lay your iron on shiny side down on a standard grip mat and load it into your machine. Select iron on from your list of materials (we are using glitter iron on so make sure to select glitter). Make sure to MIRROR your design and then cut using the fine point blade. Peel the material off of the mat when finished and weed out the negative image, leaving just the image you want on the sticky carrier sheet. Let the rotary blade cut your felt letters out and when it is done peel your felt off of the mat, but do not clean the mat. The machine can cut through the fibers that are left over. Cut two sets of each letter. 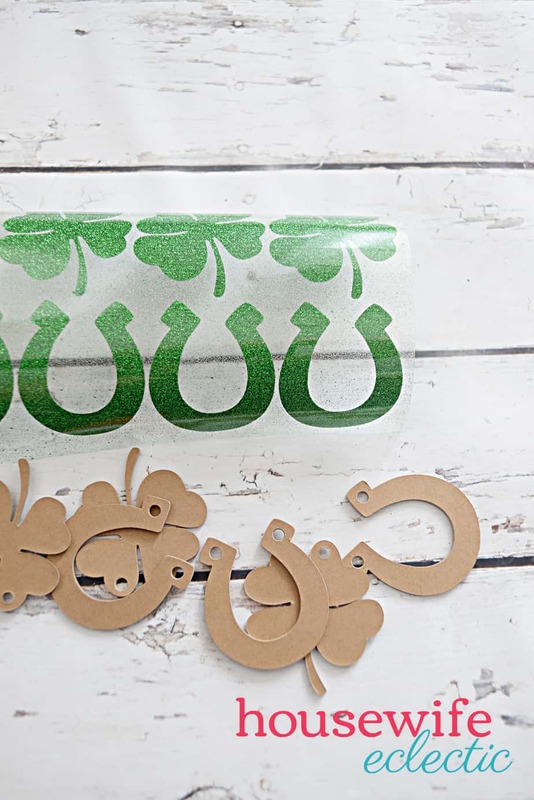 Now you should have horseshoes and shamrocks cut from chipboard, horseshoes and shamrocks cut from glitter iron on, as well as all of your felt letters. Lay out a long piece of twine and in the center lay your letters. 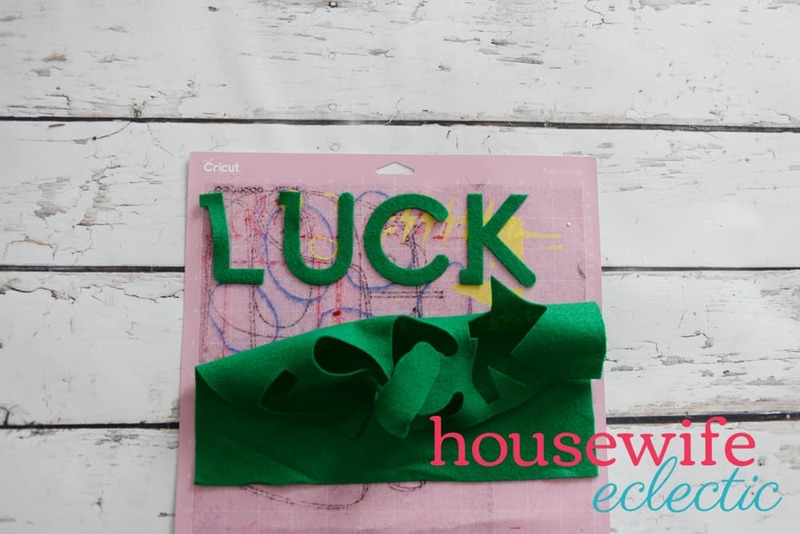 Hot glue a line on the front of four of your letters and push the twine into the glue. Add the second letter on top sandwiching the glue and the twine in between. You will use the same “sandwiching” process for the gold coins. 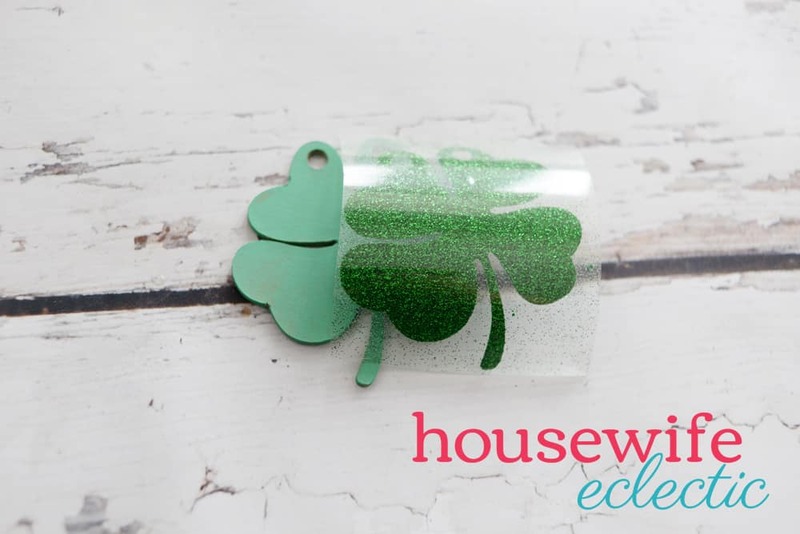 Iron the glitter iron-on onto your chipboard. I used my EasyPress set at 350 degrees for 30 seconds and they turned out perfectly. Slide your icons onto your twine as well, in between each icon add a gold coin using two coins and the sandwich method. I absolutely love how this turned out. So many different textures and it really catches your eye!